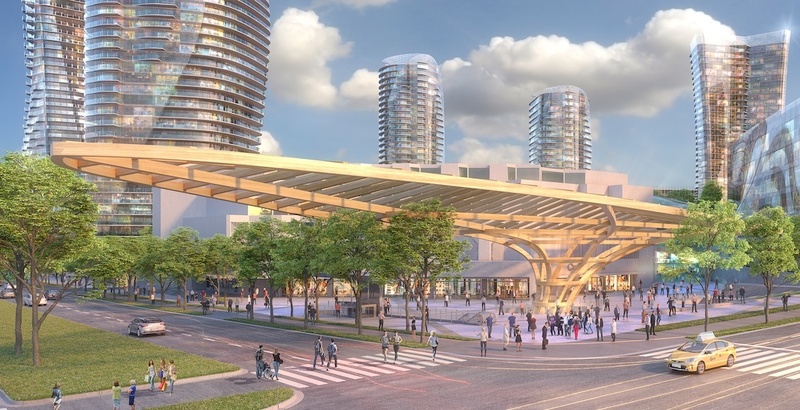 A developer-spearheaded and funded initiative will provide the Canada Line’s Oakridge-41st Avenue Station with a significant aesthetic and functional overhaul. 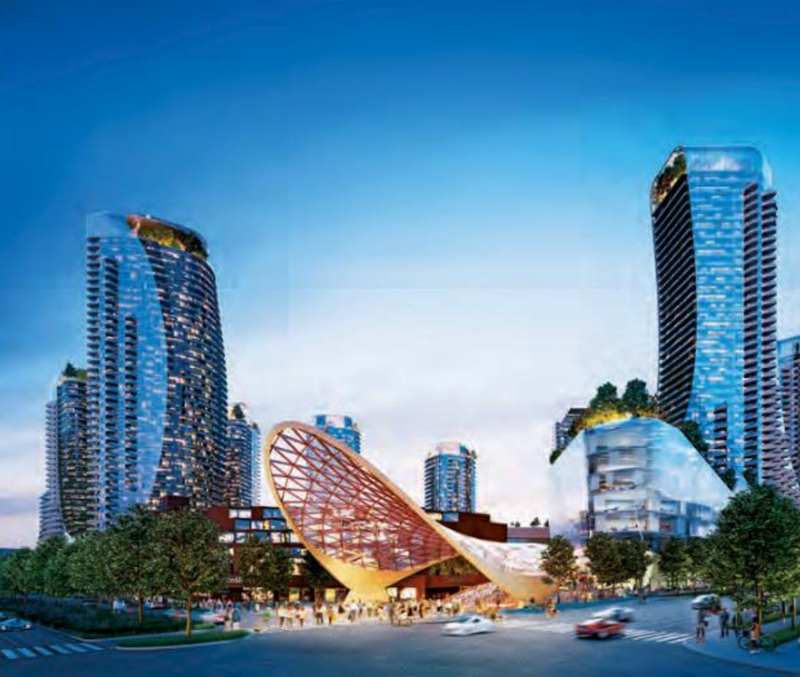 As part of the first phase of the Oakridge Centre redevelopment, Westbank and mall owner QuadReal Property Group will be rebuilding the station entrance at the southwest corner of the intersection of Cambie Street and West 41st Avenue. 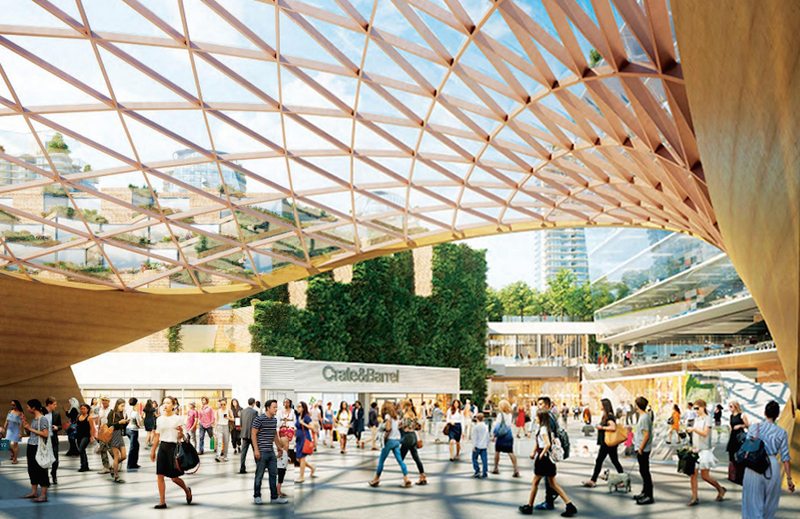 The latest design for this corner of the project involves creating a new public plaza, demolishing the existing station entrance, and constructing a new entrance just metres away, closer to the mall and aligned with the grand staircase leading up to the nine-acre rooftop public park. The new entrance provides the station with a major vertical circulation capacity improvement, with the station accessed by three escalators and a staircase. In contrast, the existing entrance only has one up escalator and a staircase. A large reflecting pool on the plaza also frames the edge of the new entrance. However, the elevator at the existing entrance location will remain. 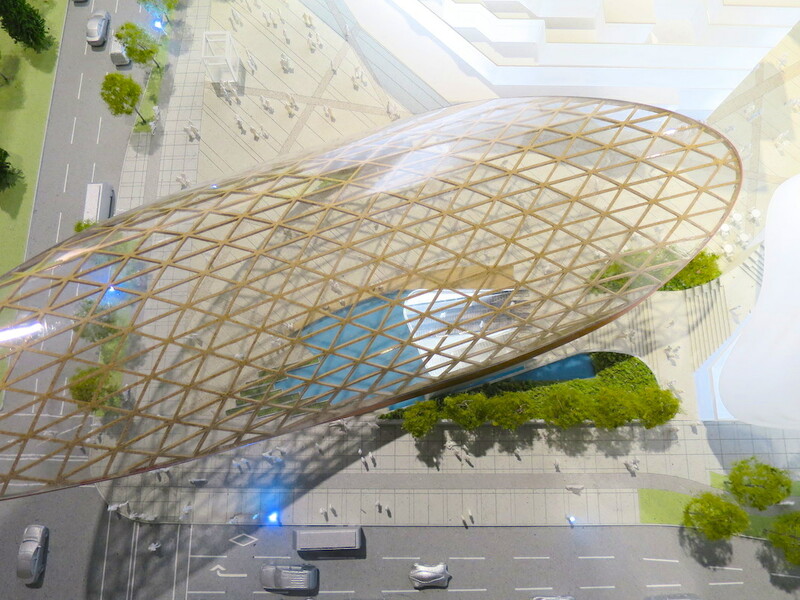 All of this is covered by a massive, saddle-shaped, landmark wooden and glass canopy that shelters most of the plaza area and hovers over a portion of the Cambie Street roadway. “Discussions with TransLink are ongoing, and we are optimistic that TransLink will be a fantastic partner as we work towards celebrating the relationship between Oakridge and rapid transit,” Jill Killeen, the spokesperson for Westbank, told Daily Hive. Killeen says the new station entrance, arrivals plaza, and canopy will be constructed in the 28.4-acre redevelopment’s first phase, which is set for a completion schedule of early-2023. 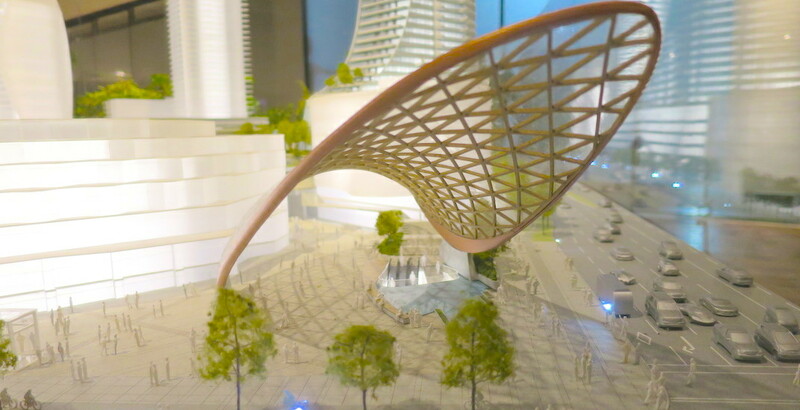 “TransLink is working with the developer and City of Vancouver to assess the impact of the proposed development on the Oakridge-41st Canada Line Station. We are still early in our review process and will share more information when we are able,” said TransLink spokesperson Chris Bryan. When all components and phases of the redevelopment reach full completion in 2025, ridership at the station is expected to grow exponentially. 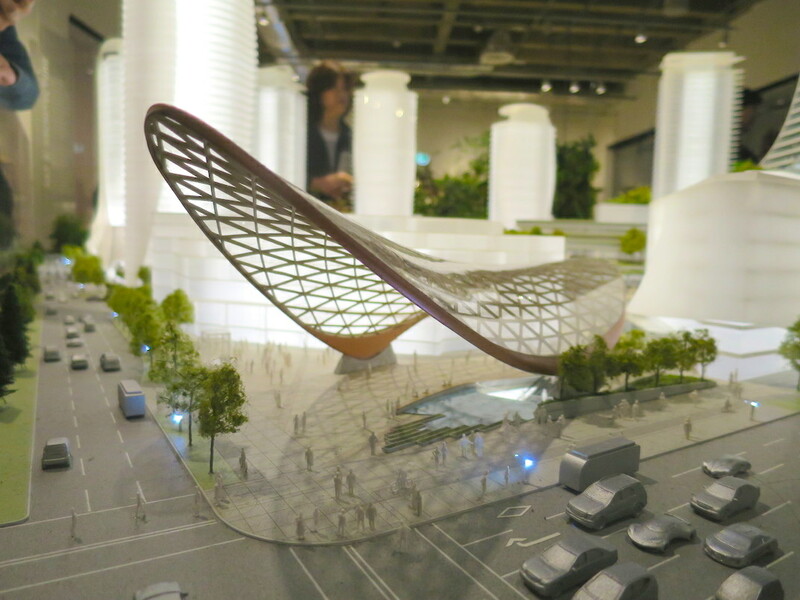 The Oakridge Centre project team anticipates the redevelopment will attract 42 million visitors per year, including 26 million shoppers, five million cultural visitors, two million public library visitors, four million residential visitors, and five million rooftop public park visitors. The aim is to reach a target of upwards of 50% of people living, working, or visiting Oakridge Centre using public transit. Currently, the station sees an average of about 8,500 boardings per weekday, making it the 22nd busiest SkyTrain station. It saw a total of 2.852 million boardings last year. It is important to note that this only accounts for the traffic volume generated by Oakridge Centre. 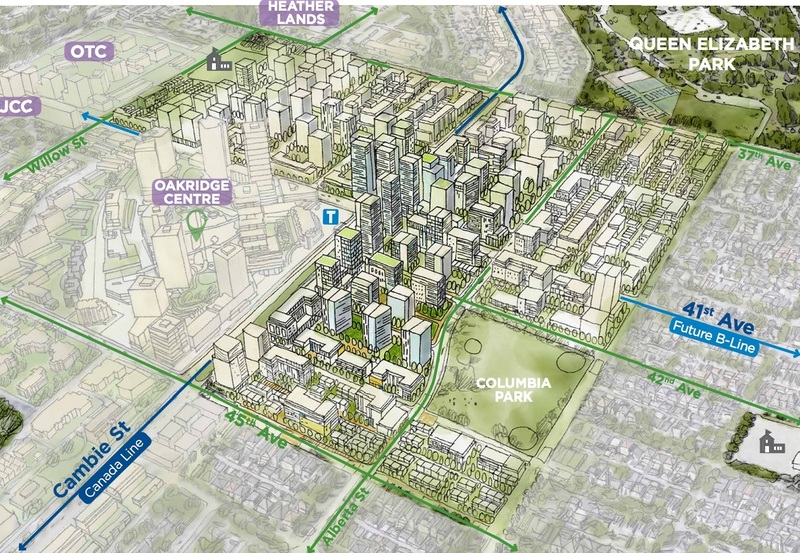 The City of Vancouver’s approved 2041 Cambie Corridor Plan centralizes the greatest densities immediately around the Oakridge Centre area: The plan calls for dozens of towers on the city blocks next to the shopping centre to form Oakridge Municipal Town Centre. The Oakridge Centre project team is depending on the capacity improvements coming to the Canada Line in 2020 when 12 new two-car trains are added, increasing service frequency from every three minutes to two minutes during most of the day. Over the longer term, there are also plans to extend all station platforms from 40 metre to 50 metre lengths to accommodate longer trains. By late-2019, Oakridge Centre will also be served by the new 41st Avenue B-Line, running between the UBC campus and Joyce-Collingwood Station with an end-to-end travel time of 45 minutes to 60 minutes during the busy peak periods, when B-Line buses are operating as frequently as every three to six minutes. 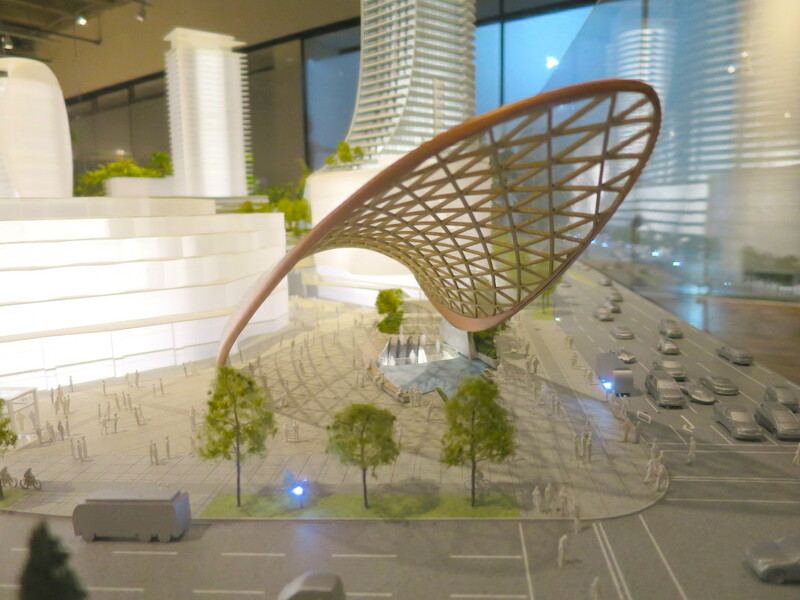 This will funnel even more passengers into the Canada Line station. 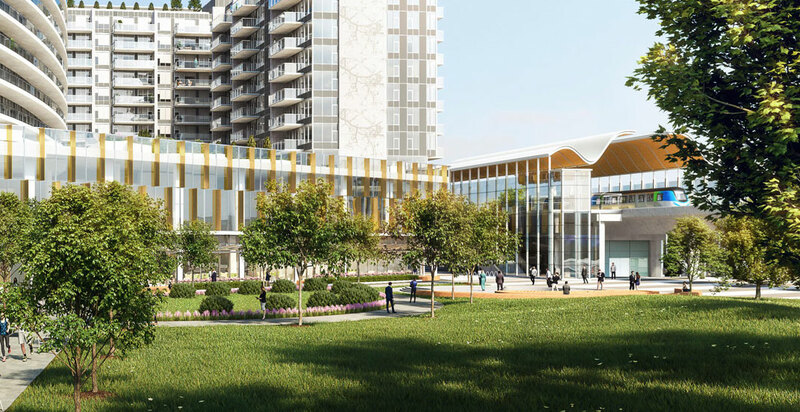 “Our engineers have studied all aspects of traffic and parking in order to ensure the expansion of Oakridge will have the smallest possible impact on automobile traffic,” reads the Oakridge Centre project team’s description on mobility. As for the Canada Line’s other major planned upgrade, Bryan says preliminary design work is underway on the new elevated Capstan Way Station — located roughly midway between Bridgeport Station and Aberdeen Station in Richmond to serve significant residential densification within the vicinity. Construction will commence on the new Capstan Way Station once TransLink completes detailed design and the City of Richmond provides the public transit authority with the full $28 million in funding to build the station. Of this total cost, which is entirely funded by the Capstan district developers, $3.5 million will go towards the design and planning phase of the project. As of late-2017, the municipal government has already raised more than $19 million, which could significantly accelerate the construction timeline of the project to start in the early-2020s. Short platforms and trains: Is the SkyTrain Canada Line under-built and near capacity?